In the broadest sense, the term BRECCIA may in some instances be applied also to impact ejecta and to displaced rock masses within the crater. The ejecta blanket of the Ries impact structure (Germany) is composed of the so-called Bunte (multicolored) breccia (clast size < 25 m) and allochthonous megablocks (coherent clasts > 25 m). The distinction has been made for mapping reasons but otherwise is arbitrary. Disregarding this arbitrariness, the Ries crater ejecta as a whole may also be termed a megabreccia. 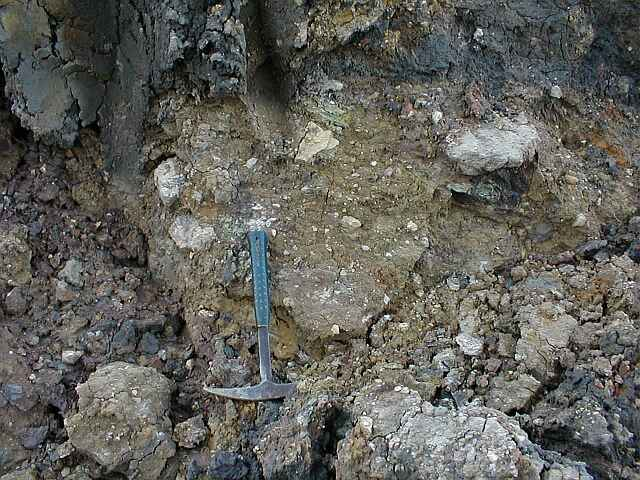 In the impact literature, extensive breccias containing very large components are generally termed megabreccias, and they have frequently been reported (e.g., for the Wells Creek, Steinheim basin, Gosses Bluff, Sierra Madera and Wetumpka impact structures). Perhaps most impressive is the Late Devonian Alamo megabreccia (see, e.g., http://www.lpi.usra.edu/meetings/largeimpacts2003/pdf/4055.pdf) giving evidence of a giant offshore impact. Below, we show images of the polymictic Ries crater megabreccia (Bunte breccia ejecta) and of polymictic megabreccias (displaced rock masses) in the Rubielos de la Cérida impact basin (Spain). Fig. 1. Megabreccia: Bunte (multi-colored) breccia ejecta, Ries impact structure, Ronheim quarry. 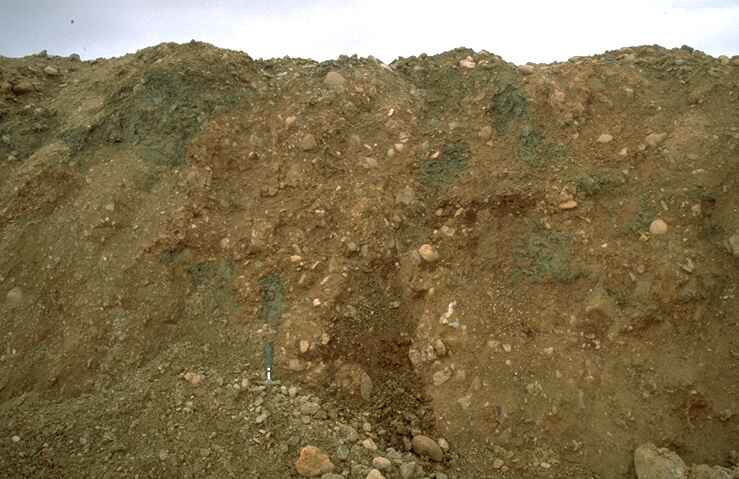 Because of continuous removal of the breccia overburden material the outcrop conditions are changing also continuously. Fig. 2. Aspect of the megabreccia near Barrachina, Rubielos de la Cérida impact basin. The polymictic, multicolored breccia has much in common with the Ries crater Bunte breccia. 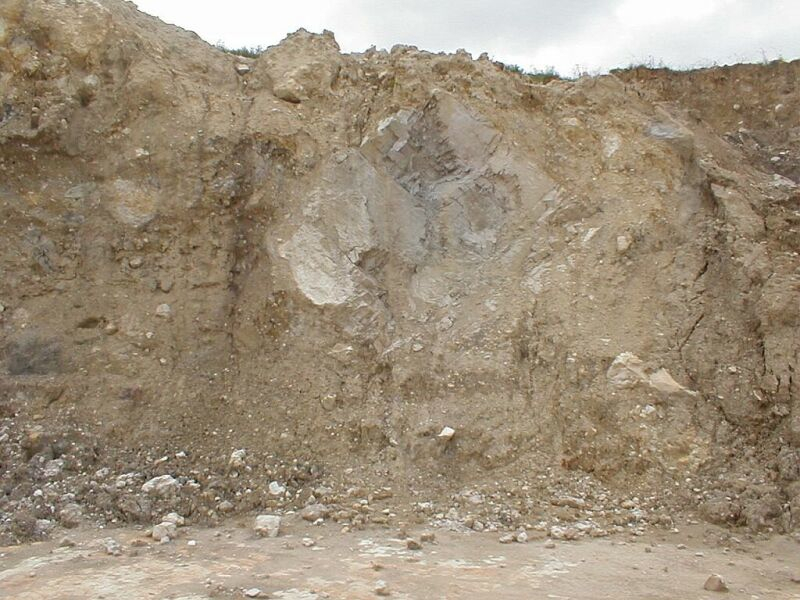 The quarry of the temporarily exploited material for road construction opened a highlighting insight into Tertiary impact geology until then completely unknown to geologists. Unfortunately the quarry was leveled subsequently, and thus regional geologists had again peace of mind. Fig. 3. Bunte breccia of the Ries impact structure. 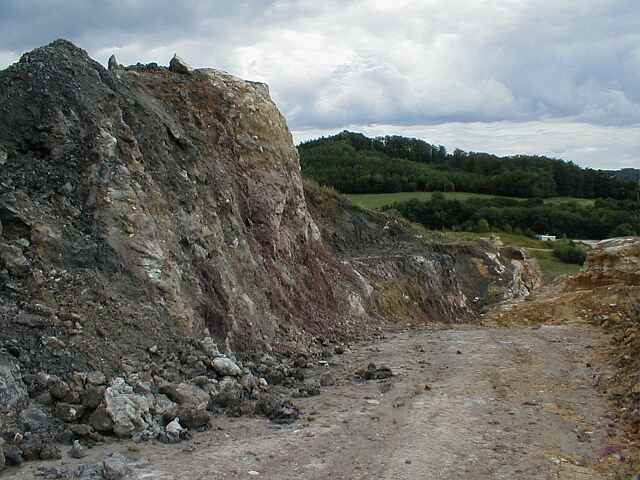 Ronheim quarry. Fig. 4. 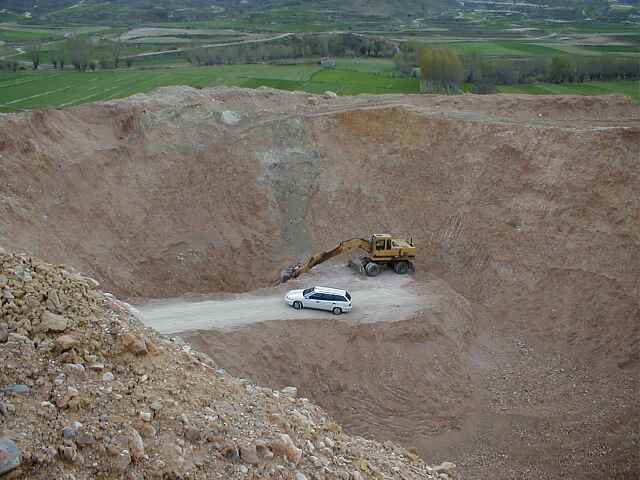 One more aspect of the Barrachina megabreccia in a second temporary quarry for road construction material, Rubielos de la Cérida impact basin. Compare Fig. 2. Fig. 5. Another aspect of the Barrachina megabreccia in a temporary quarry that exhibited big blocks of a suevite breccia. Fig. 6. Bunte breccia ejecta of the Ries crater; Ronheim quarry. 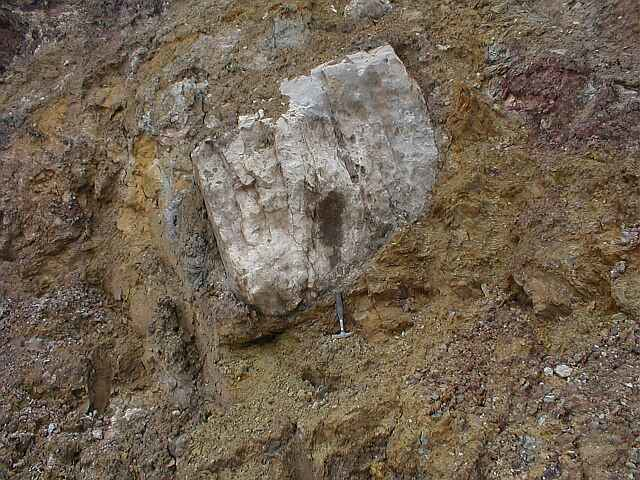 A Jurassic limestone block is embedded in a multi-colored mixture of sedimentary (Keuper) and crystalline material. Fig. 7. Polymictic megabreccia and an intercalated Muschelkalk limestone/dolostone block; southeastern rim of the Rubielos de la Cérida impact basin. Fig. 8. 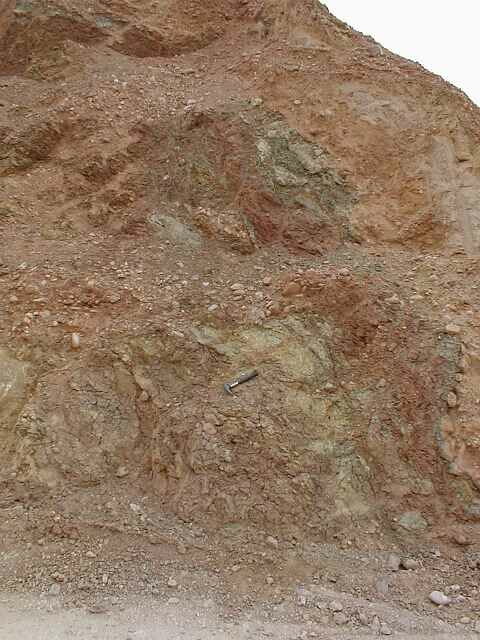 Bunte breccia of the Ries impact structure; Gundelsheim quarry. Height of the wall is about 6 m.